For the first time, a team of scientists has calculated the distribution of all light energy contained within the Milky Way, which will provide new insight into the make-up of our galaxy and how stars in spiral galaxies such as ours form. The study is published in the journal Monthly Notices of the Royal Astronomical Society. This research, conducted by astrophysicists at the University of Central Lancashire (UCLan), in collaboration with colleagues from the Max Planck Institute for Nuclear Physics in Heidelberg, Germany and from the Astronomical Institute of the Romanian Academy, also shows how the stellar photons, or stellar light, within the Milky Way control the production of the highest energy photons in the Universe, the gamma-rays. This was made possible using a novel method involving computer calculations that track the destiny of all photons in the galaxy, including the photons that are emitted by interstellar dust, as heat radiation. 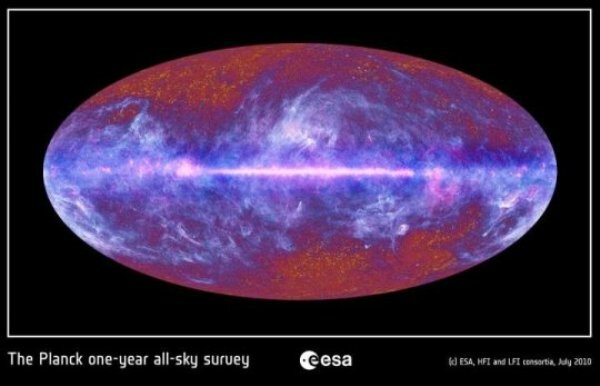 Previous attempts to derive the distribution of all light in the Milky Way based on star counts have failed to account for the all-sky images of the Milky Way, including recent images provided by the European Space Agency’s Planck Space Observatory, which map out heat radiation or infrared light. By tracking all stellar photons and making predictions for how the Milky Way should appear in ultraviolet, visual and heat radiation, scientists have been able to calculate a complete picture of how stellar light is distributed throughout our Galaxy. An understanding of these processes is a crucial step towards gaining a complete picture of our Galaxy and its history. The modelling of the distribution of light in the Milky Way follows on from previous research that Prof Popescu and Dr Richard Tuffs from the Max Planck Institute for Nuclear Physics conducted on modelling the stellar light from other galaxies, where the observer has an outside view. Scientists have also been able to show how the stellar light within our Galaxy affects the production of gamma-ray photons through interactions with cosmic rays. Cosmic rays are high-energy electrons and protons that control star and planet formation and the processes governing galactic evolution. They promote chemical reactions in interstellar space, leading to the formation of complex and ultimately life-critical molecules.